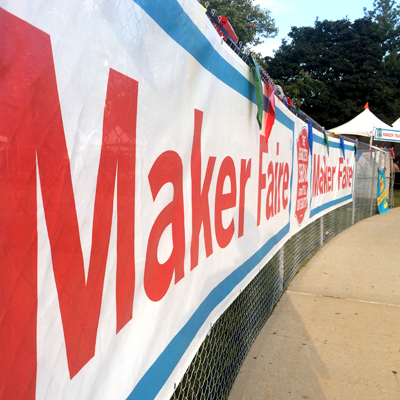 After the EE Journal team’s inspiring and fascinating trip to last year’s World Maker Faire in New York, we were pumped this year to head out again to the New York Hall of Science in Queens for the 2015 World Maker Faire. Once again, the “Greatest Show (and Tell) on Earth” did not disappoint. We came away excited and energized and ready to tinker around with our own Arduino boards, 3D printers, robots, and quadcopters at home. Companies like Microduino, Little Bits, and Brick’R’Knowledge were all showing off their own versions of small, magnetic, stackable (or connectable) blocks for processors, perhipherals and sensors intended to make electronics projects easy to design and assemble. These stackable or connectable blocks make electronics projects easy and accessible for beginners, and their plastic and magnets are durable enough to last in an education environment where students aren’t always easy on their tools and materials. While these modular blocks are easy to use, they are also robust enough to be used for more than just basic applications. A user who gets drawn in by the simplicity of the building blocks can gradually advance to ever more complex and interesting projects. These building blocks are a perfect illustration of one of the major themes of this year’s Maker Faire, what Bob Martin of Atmel calls “the onion layers.” Martin says every electronics project has layers and layers of technical complexity, and not every maker is interested in diving down through those layers to the same depth. One of the major goals for companies serving the maker market is to allow for an experience that is scalable according to any given maker’s expertise and interest in the deep, technical details of their project. Successful components and systems need to be approachable by makers who are beginners and aren’t yet ready to dive into the incredible complexity of advanced coding, or by hobbyists who just want to know enough to make their omelet-making robot. These people want to skim the surface – the very outer layer of Martin’s onion. But there are also makers who want to dig much deeper, who are inspired to dive past the simple “easy-to-use” modes and learn even more about the gritty, technical, soup-to-nuts details of the components they’re using in their project (and their next project, and the one after that…) The goal of many of the large engineering companies at Maker Faire is to scale right along with their very broad audience — to provide as much hand-holding as possible for the beginners and surface skimmers and to be robust enough for the people who want to drill right down to the very center of the onion. At the NYC Resistor booth inside the Hall of Science there was a video game called Semaphore Hero. Semaphore Hero is a cute riff on the popular Guitar Hero game where the guitar has been replaced with two small flags and you’re on a desert island instead of inside a concert venue. Sensors on both flags relate to a sensor on a life jacket the player wears as the player attempts to copy the example semaphore signals on the monitor to signal for rescue from the desert island. The better the player can position their body and flags to copy the proper semaphore, the more points they score. 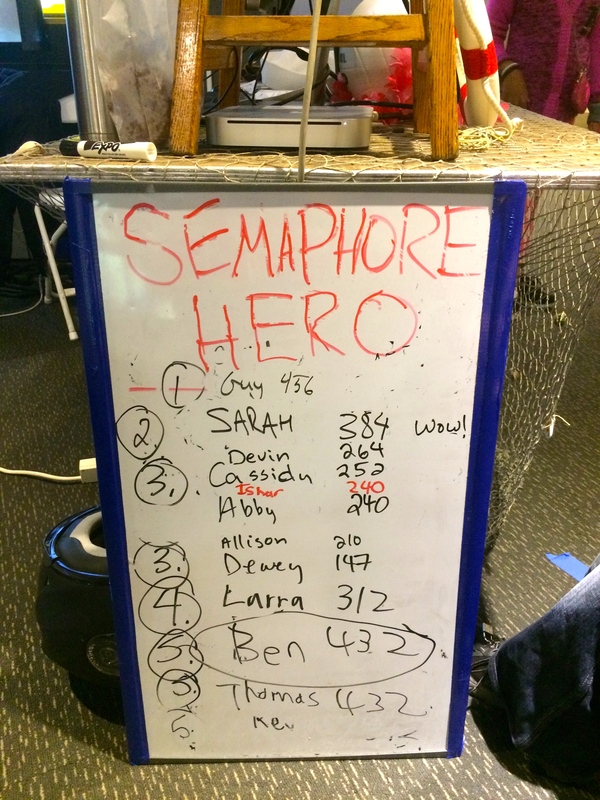 The Semaphore Hero Game helps to illustrate the wide spectrum of projects on display at Maker Faire. There are incredible, inspiring booths with projects from makers who want to change and save the world. There are tents devoted to recycling urban trash into 3D printing materials, projects that use technology to provide cheap, clean water to impoverished parts of the world, people who make conductive play dough to teach four-year-olds about electronics so they might be inspired to become engineers, a NASA contest devoted to building habitats on Mars, and makers designing more sophisticated prosthetics for disabled people. These projects are all admirable, but it’s also nice to see people making and using engineering purely for the joy of it. Doing something simply because it captures your interest and imagination is important for its own sake (and because it inevitably makes you a better, more creative, and more technically proficient engineer). The diverse maker community and the variety of projects on display are what make the maker movement so robust and so exciting. 3D printing technology continues to march forward, and the progress since last year’s faire is impressive. Resolutions are higher, printers are more affordable, materials are more varied, and the ecosystem has grown considerably. This year, Maker Faire attendees gathered around to witness the dramatic unveiling of the new Glowforge (a laser printer that can etch and cut all kinds of materials), giant 3D printers, the world’s tiniest 3D printer, and Pancake Bot — which was busily printing edible pancakes in any shape or design its audience could dream up. These advancements in 3D printing are valuable to people who are inventing and prototyping. Historically, some of the hardest obstacles to overcome for engineers and makers in creating electronics inventions and prototypes have been the mechanical challenges involved in every project. Affordable, accessible 3D printing could provide a quantum leap forward toward overcoming those mechanical challenges for electronics designers. Aaron Taylor Kuffner’s robot gamelan was the most beautiful and artistically appealing project at the faire. A robotic installation designed and built to play instruments from Javanese and Balinese gamelan orchestras with computer controlled, servo-actuated mechanical mallets, the Gamelatron looked visually stunning and sounded musically beautiful and interesting. The installation included about a dozen bean bag chairs placed right in the middle of the orchestra so that faire attendees could take a moment to flop down and relax with the music all around them. Many, many faire visitors took full advantage of the opportunity. The Gamelatron is a stylish and impressive example of the intersection of engineering and art, a topic we at EE Journal have written about previously here and here. In addition to all the cutting-edge 21st century on display, the Maker Faire also has considerable space devoted to traditional arts and crafts. There are booths for yarn lovers, hand sewers, and woodworkers. Many projects that incorporate complicated technology either include major traditional craft components or are pursuing an artistic end goal. The fusion of art and technology is a hallmark of Maker Faire and the maker movement, and the most interesting and inspiring projects exist at this intersection. The most exciting thing at World Maker Faire this year was the crowd of young makers in attendance, energized and excited about engineering. The Young Makers tent catered to the very youngest do-it-yourselfers, but kids were by no means confined to that area. Young makers were all over the Faire. Kids pounded out the theme to “Godzilla” or played delicate Chopin waltzes on Guerilla Science’s Fire Organ, delighted to see the soundwaves they’d created rendered as a wall of burning gas. They played with robots and steered all manner of remote control vehicles around the faire. They joyfully poked, prodded, and “ooh”ed and “ahh”ed at pretty much every demo. They showed off projects they were proud of: Quin Etnyre, the 14-year-old CEO of Qtechknow was showing off his first successful kickstarter project, the Qduino Mini, a small processing board compatible with Arduino. He was also promoting his next project — a digital camera with a built-in printer that instantly prints photos on inexpensive thermal paper. Omkar Govil-Nair, an eight-year-old maker, was displaying his O Watch – a 3D-printed programmable watch for kids. It’s wonderful to watch these young people as they are introduced to engineering in a supportive, encouraging tribal environment with a hands-on approach. The culture at Maker Faire is exciting and welcoming and explicitly intended to strip away intimidation and fear. The project-oriented nature of the maker movement hooks the young newcomers and inspires and motivates them to learn everything they need to know to build whatever project caught their eye or captured their imagination. The message of Maker Faire is: “You can do this project and the people here can help!” Some of these kids will engineer the next big paradigm shift. Others will create the next ground-breaking fusion of art and technology. These young minds will change or save the world. Or, maybe they’ll just build the next semaphore-based video game. That’d be great, too.